I got the wedding dress onto a hanger to wait for the next fitting, and with a HUGE sigh of relief, dragged out my box of SWAP sewing, containing the red Kathryn Brenne trousers [V9114], the red silk kimono tunic [V8434], Style Arc Daisy black linen trousers, and the black denim trousers from V1415. Those trousers have been BUGGING me! 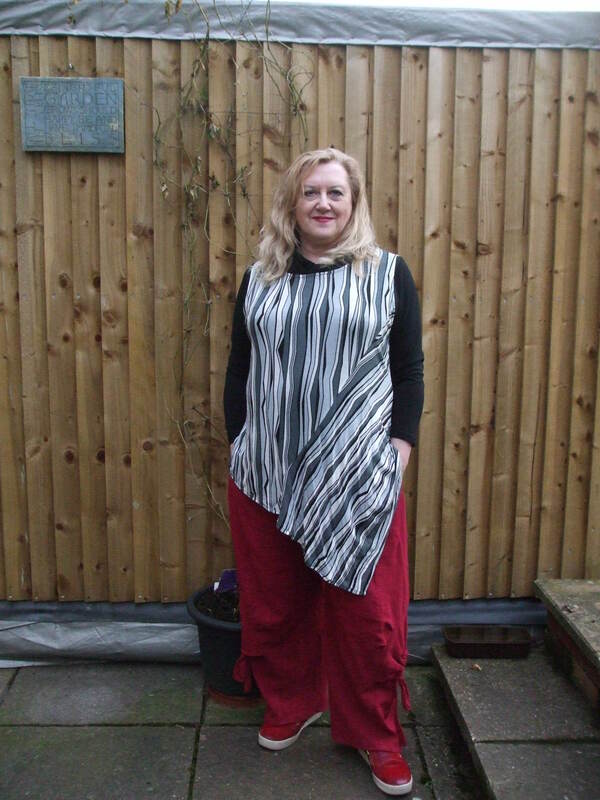 Reminder- the Daisy wide leg trousers are HUMUNGOUS and the pockets, a very nice style detail, are so big and low you need to kneel down to reach to the bottom of them! The denim ones are almost as vast, and may well need a total recut. 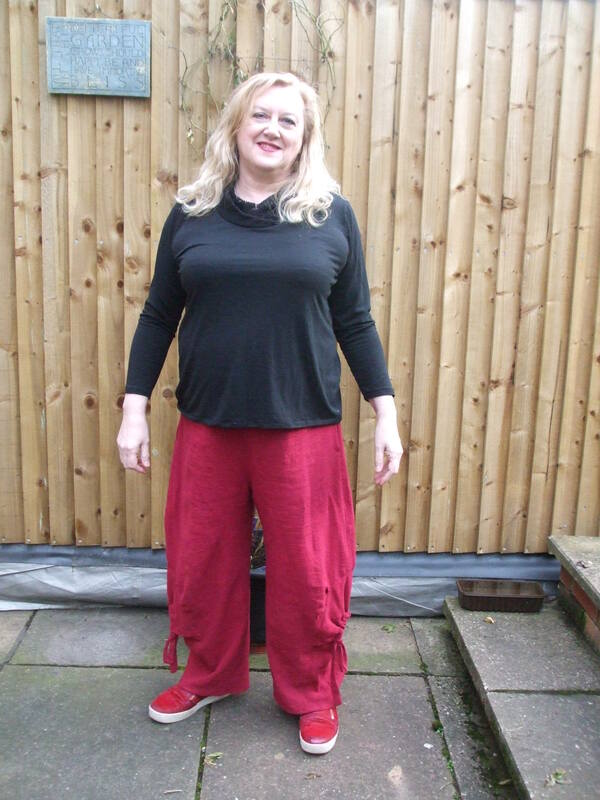 I WANT to embrace baggy trousers, they just make me look like a ruddy hobbit in real life. Sigh. I already have 8 items made up suitable for SWAP, with a couple of choices for pre-made so I’m not unduly pressured by time ticking on- I really do need some trousers though, my current stable are looking a bit meh after several years of wearing and washing. 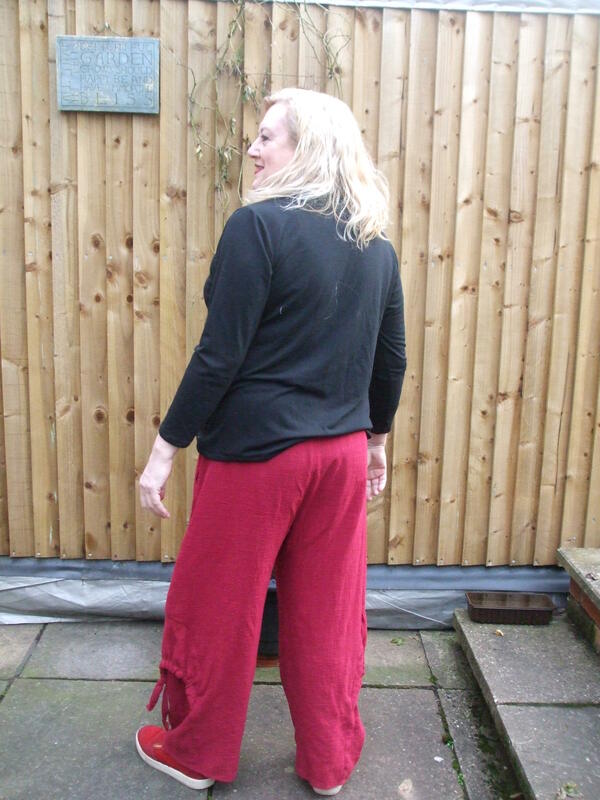 The red Brenne experimental trousers look fun, and cool and comfy for summer wear, so I started on them. This crinkle linen/cotton blend feels lovely but is very loosely woven and consequently quite stretchy. 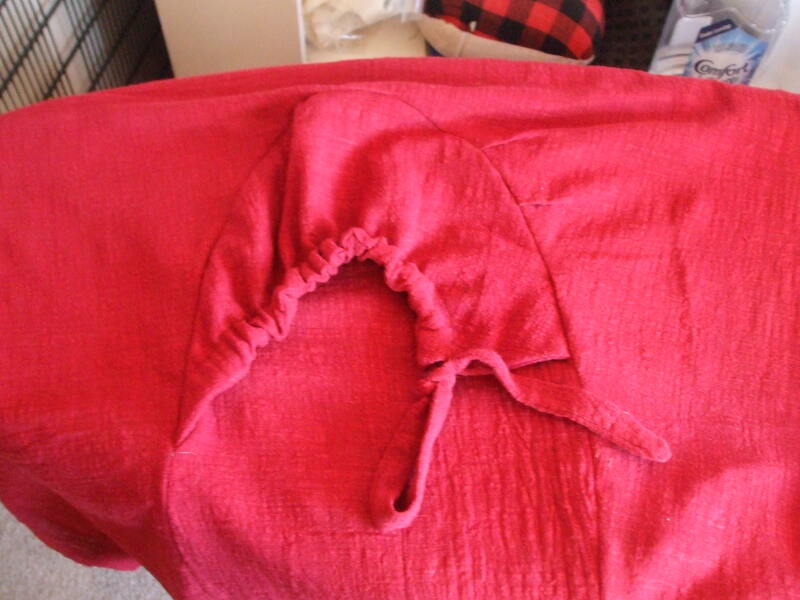 I’ve started basting in pleats and putting together the funky little drawstring leg inserts- interesting! Of course, the pocket pieces that I cut out of black taffeta for the first Brenne skirt [and then forgot to insert] were elusive…two were folded with the pattern piece, one turned up in a different pile of sewing,,,and the fourth had vanished. Stash supplied me with a replacement, but it’s mildly irritating- I’d pinned all the other small pieces onto their respective pattern pieces, just not this one. Bum. Ah well, these went together VERY easily. The funky inserts are perfectly drafted, and the only trouble I had was in turning the ties- the crinkly fabric sticks to itself A LOT and they had to be coaxed and tweaked and sworn at quite a lot. Good job they’re short! Oddly, although the line drawing looks as if these are tied into a small bow, you actually have to knot it, as there is only one string, nothing to tie it to..odd, but it looks cute. Those little inserts are made from FOUR pattern pieces, plus the tie- no bulky fabrics for this little beauty! Because of the loose weave, I double stitched the crotch seam, then pressed it to one side and stitched again…hope it works. 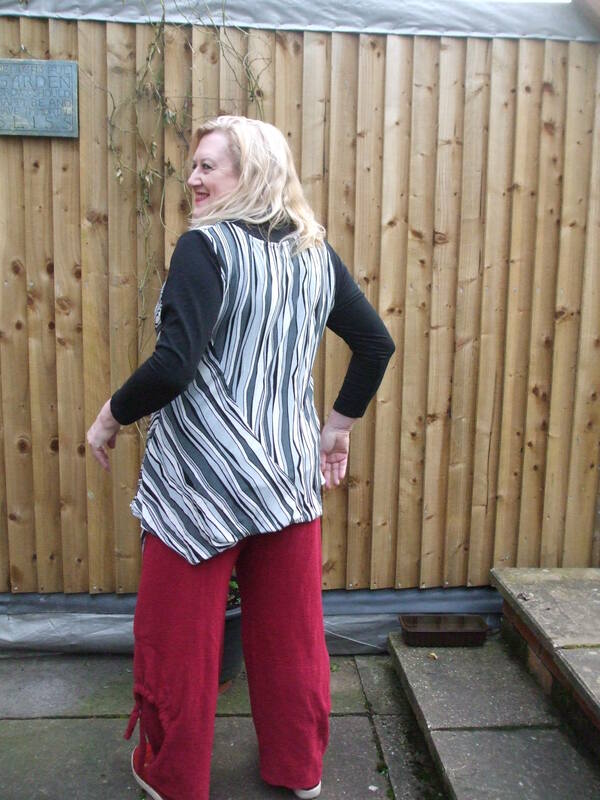 Everything else, I just zigzagged- I didn’t want to stress the loose weave in the overlocker- I’ve found that droopy fabrics often pull apart at the seams if overlocked. It’s a nice soft elastic waistband, just the same as on the tie-side skirts, very comfy to wear, and tidy to attach. The pockets are nice and roomy too-yay for pockets! Hmm. You’re old enough; remember the song “Things that make you go ‘hmm'”? I have that pattern. Thanks to Joanns I have a gazumpty katrillion patterns. I have been lukewarm about their baggy enormity, but that gather on the side is looking far more intriguing in real life than I’d ever given it credit for. 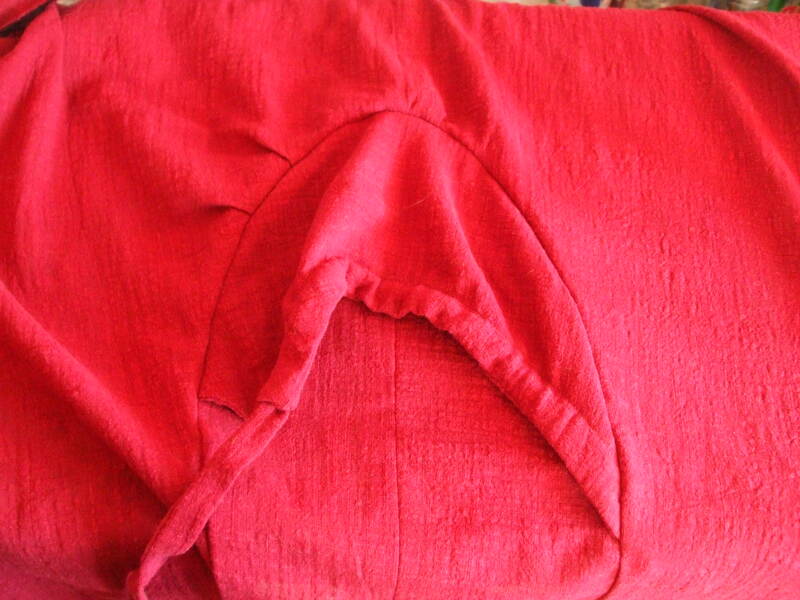 If I made that shape the hem on the pants (an elongated angled line that starts as a oval cut in) I might be happy. Or a really funky hobbit. And at this point in my life, I can go either way. Thanks for this. Pinning to the ‘funky pants’ department. Funkalicious- and an ingenious little bit of drafting, they will make you whistle cheerfully as you flap the giant pockety legs abut with happy fists! I love the quote above about ‘a really funky hobbit’. Cool trousres! 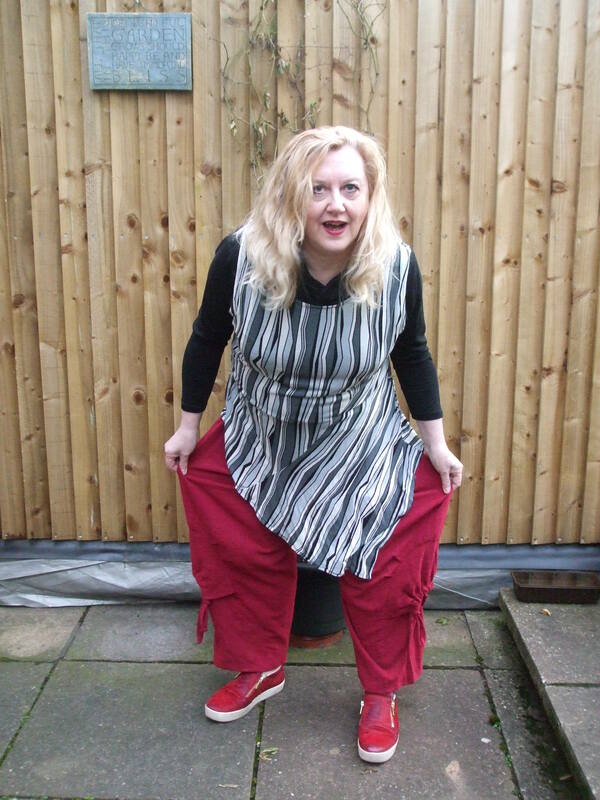 I love wide-legged trousers and I’m short, I don’t listen to anyone! I’m not seeing these as an at all unflattering look on you, especially with the closer fitting black top. Maybe just unfamiliar? And yes, very interesting pattern, I hadn’t looked closely at it before. Those are very cool and I am not seeing the hobbit effect at all! Your hair is looking fab. Wish I could get mine that colour! Thanks, twice! The hair is in desperate need of a cut, but I’m liking the colour too. I’ve been toning it down to ashy/beigey blonde, in the hope I can grow out and let it go grey- but my roots are still too pepper & salt to let it go yet. I cycle between some of the lightest shades on the Preference range, mainly 10.1 and 10.21, with occasional 01 and 9.1. Makes it look highlighted! I love, love, love the look of those trousers! They’re absolutely awesome, I love that fabric and the colour, and can I steal your shoes? (No, wait, there’s no way they’ll fit – but I do want a pair like them!) The ruching thing/upside—down pocket on the lower leg is genious. Looks so funky and gives shape. 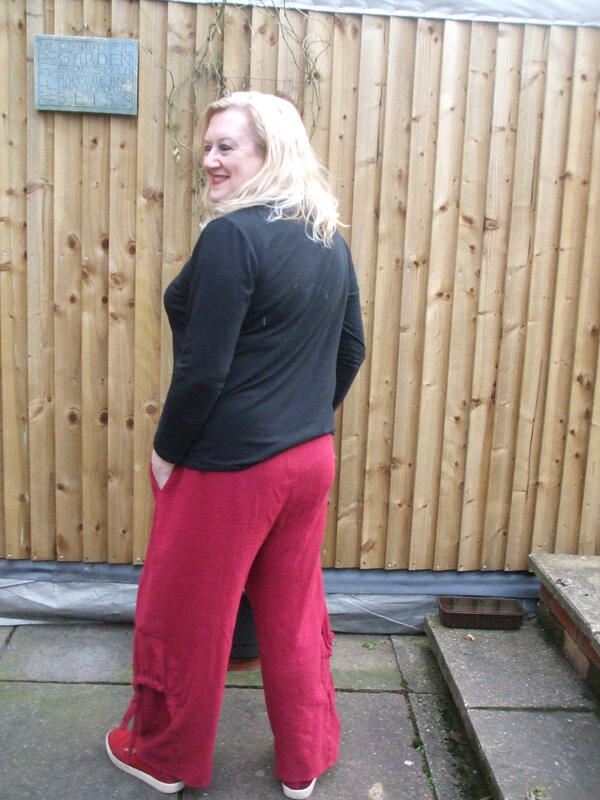 Actually, these remind me of some former favourite trousers of mine, made in a very soft and drapey red baby cord. I might have to splurge on this pattern… Don’t know how you got the idea these are not flattering, you look fabulous! lol thanks for the enthusiasm- I must admit, I keep reaching for them, so they def feel good to wear! The shoes are dying unfortunately- the kind that can’t be re-soled. they are actually HAIRY which makes me absurdly happy, very odd things! I have a pair of hairy low boots. As soon as the ice is gone I can start wearing them, I’m almost giddy I love them so much. Red pony ftw! Actually I do think they are flattering – not hobbit-like at all – You need to re-look at your photos with an objective eye. You’re cool. Lol I’m as cool as a black of lard, but thanks! They feel good to wear, I just need to try them with various tunics to see if they look too pyjama-like, then they may well enter the SWAP. Another pair in black would be very useful, I must admit. I like them. They look like a lot of fun to wear. Previous Previous post: Five Minutes of Fame? Next Next post: Kimono-ver to My Place!